It’s now just one day away from the curtain being raised on yet another Premier League campaign at the John Smith’s Stadium. But as always, in the off-season, the talk of the Town has been the transfer window, and Town’s activity within it. The window slammed shut early this year before the season starts to avoid difficult situations for managers, players and clubs. This should suit Town down to the ground, as Wagner has achieved somewhat of a reputation for getting his business done early, allowing players to settle into the club during pre season. Wagner hasn’t brought as many players in as we have come to expect in the summer window, but the squad didn’t need as much work this time around. The German has still improved the ranks with some quality additions. Two of the most important bits of business were done before last season ended, with both Jonas Lössl and Florent Hadergjonaj making their loan spells permanent. These deals outline how savvy and clever we have become in the market, as they were completed even before our top flight status was secured. Following the memorable night at Stamford Bridge that secured safety, the priority in the transfer window became very clear – we had to keep Terence Kongolo. The man-mountain made such a huge impact after joining on loan in January, featuring at both centrally and on the left side of defence. These intentions of keeping such a top class player at the club showed clear ambition, but with other clubs sniffing around, whether it was a realistic move was questionable. But Town pulled it out of the bag, as Kongolo returned to the club for a record fee of £18million. The fact we’re in a position to spend that sum on one player shows just how far we’ve come in a short space of time. Kongolo was the second signing of the summer, following the addition of Ben Hamer from Leicester. He joined on a free transfer, after the departure of Rob Green, who has subsequently signed for Chelsea. Due to Jonas Lössl being away with Denmark at the World Cup, Hamer has been the main goalkeeper for Town in pre season, impressing particularly in the home friendly against Lyon. Lössl only featured in Town’s final two pre season games, and there is definitely an argument for Hamer to start against Chelsea. One thing for sure is that Lössl will have far better competition for the jersey than last term. Town had four players in World Cup squads this summer in Russia. One of which was a summer addition from Stoke. Egyptian winger Ramadan Sobhi signed from the relegated outfit for around £5.7mil. The 21-year-old fits Wagner’s ethos of signing young hungry players with a point to prove. He scored against the Terriers last term and adds to the increasing options in the wide areas. Juninho Bacuna became signing number six when Wagner went to the Eredivisie to poach one of their top young talents. The 21-year-old Dutch youth international has made over 80 appearances for FC Groningen, and will provide more competition in the centre Town’s midfield. This is already a strong position, with Wagner having Mooy, Hogg, Billing and Williams to call upon. It is believed that the deal was only worth around £2.25mil. Wagner’s scouting range is wide to say the least, and he has gathered a reputation for finding gems from abroad. But signing number seven, Erik Durm is definitely already well-known to Wagner. Durm was converted from a striker to a full-back under the Town Head Coach’s leadership at Dortmund, and certainly made his mark in Germany. He is in fact a World Cup winner, having been part of the squad that were champions in 2014. Durm can play on either the right or left side of defence and will add even more quality to an impressive backline, despite missing last season with a bad injury. Who would’ve thought that Town’s feeder club would one day be Monaco. But it seems that is now the case, as we added a second player from the French giants following Kongolo’s move. Adama Diakhaby, a lightening fast winger, was signed to add yet more quality to a problem area last term. The 22-year-old was added for around £9million, after falling out of favour at Monaco despite being signed as the long-term replacement for Mbappe. Early signs in pre season suggest he will be a real hit with the Town fans. Town’s final signing of the window came on deadline day, with Isaac Mbenza making the same move Steve Mounié did last year, from Montpellier to Huddersfield. The right-winger joins on an initial season-long loan with Town having the option to sign him permanently at the end of the campaign. Town have exercised this option well in similar deals such as Kachunga, Lossl and Hadergjonaj. Mbenza’s link up with Mounie could be vital, with goalscoring hopes again hanging with the big striker. There have been a few exits during the window, but Town have managed to yet again keep hold of their most prized assets. Tom Ince was the most notable departure, in a £12mil move to Stoke. Hefele, Malone, Holmes-Dennis and Scannell have also departed on permanent deals. Jack Payne and Joel Coleman have headed out on loan deals. For the first time under Wagner we have been in a position where the squad depth is good enough to allow fringe players to leave. Wagner’s work in the window has been impressive yet again, and the anticipation for the season opener is increasing by the second! Add to that, Town have tied down Christopher Schindler to a new three-year contract, with the option of a fourth. Saturday is set to be yet another memorable one down at the John Smith’s! 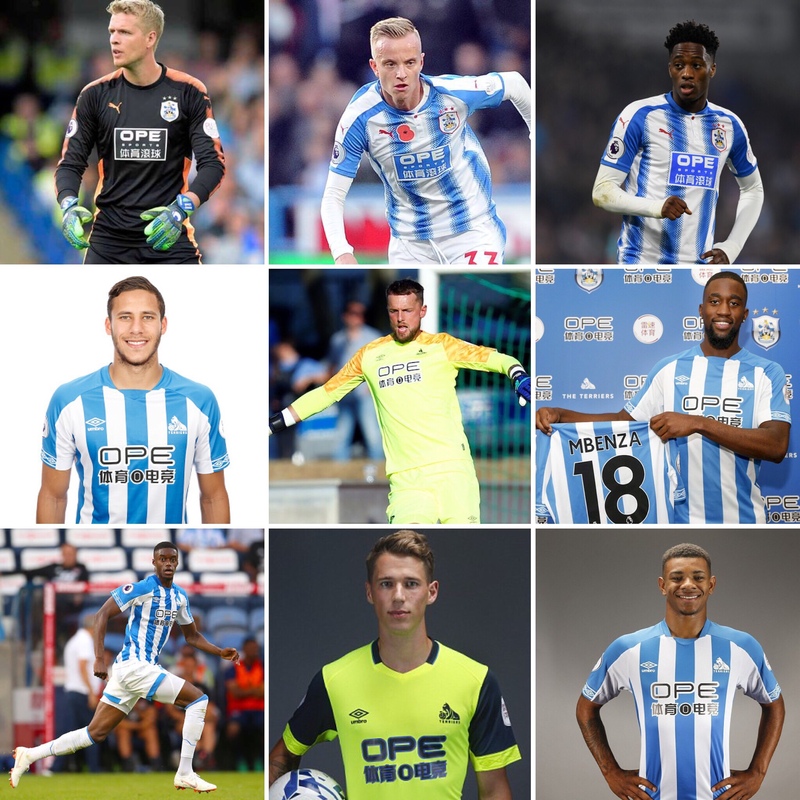 Considering all incomings and outgoings, how would you rate Town’s transfer activity overall? Town’s best signing of the window? Next The Dortmund dynasty in… Huddersfield! I bet that you’re regretting this post, Harry! What a crap summer’s investment we had!